We love Maxi-scooters for their long-legged touring ability, motorcycle-like handling, twist-and-go convenience, and overall ride comfort. But when one often cost as much as a middleweight sports tourer, sometimes buying one is difficult to justify. 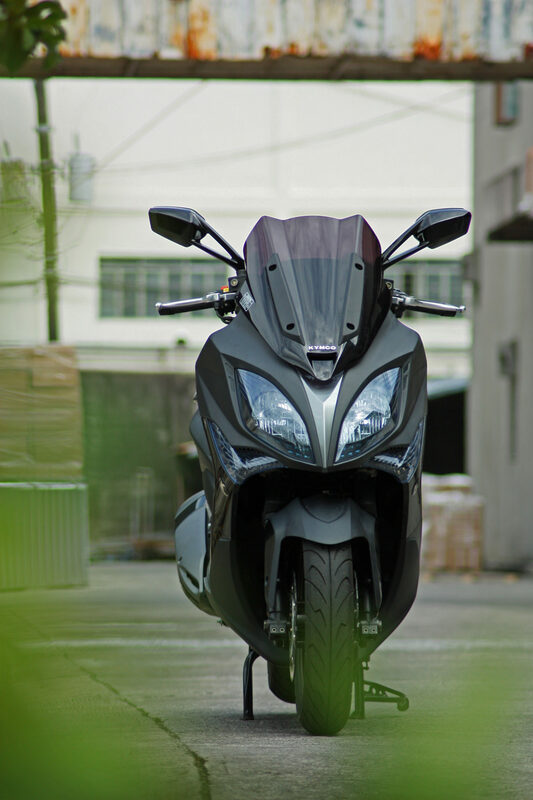 Especially when you consider that most are in the same ballpark as the Kawasaki Ninja 650 and Suzuki Bandit 650. Both exceptionally good all-rounder bikes. Well, unless that particular maxi-scooter is truly exceptional in terms of design and performance then the cost may somehow justify the steep asking price. Then again, that’s a tall order for something that’s basically an oversize scoot. 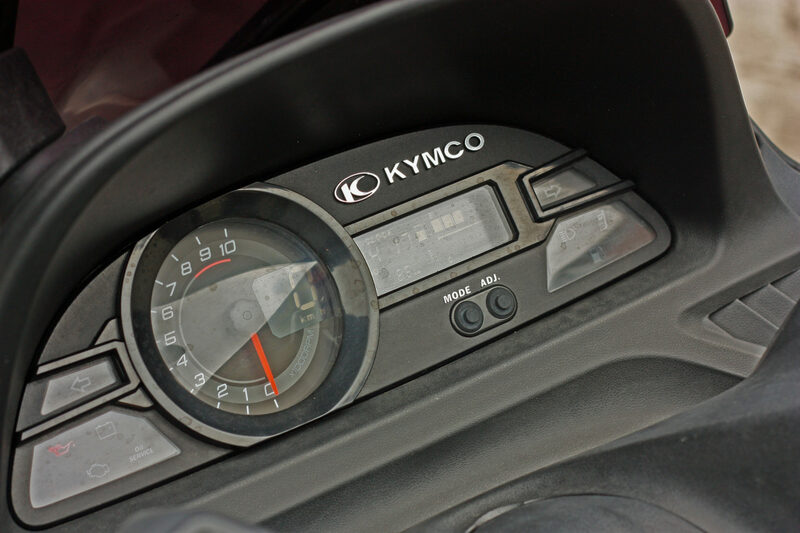 Then there’s the Xciting 400i, the maxi-scoot entry from Taiwanese company Kymco. 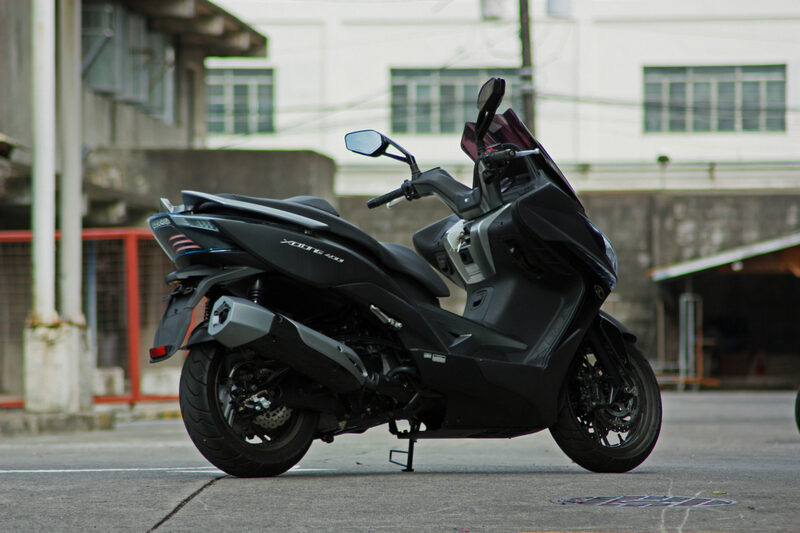 I must say the Xciting 400i looks mighty handsome for an oversized scoot, and if you think it looks deceptively like the BMW c600 Sport then you’re not alone. Everything about it screams Teutonic; from the twin-headlight fairing design, LED light accents down to the ABS equipped triple-disc brakes setup, which is hardly surprising considering Kymco had a hand in the c600 Sport (and c650 GT) design and the Xciting is targeted towards the European market where maxi-scooters are quite popular. Compared to other maxi-scooters of the same displacement the Xciting 400i is relatively compact, which makes it more maneuverable in city traffic. Rider and passenger accommodations on the other hand is generous, with wide and nicely sculpted seats ideal for long-distance riding. For added comfort the rider get a lower back support while the pillion get a stepped up seat for a commanding view of the road ahead. There’s a natural reach to the handlebar. With all the pertinent switches where you expect them to be. The side mirrors are large and placed at just the right height and angle. 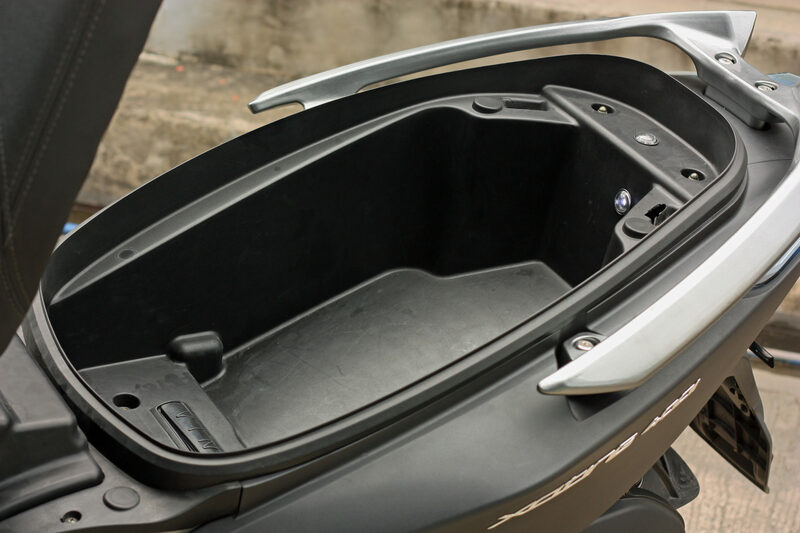 A maxi-scoot is not without maximum storage compartments. Under the seat there’s enough storage for a full-face helmet with room to spare for a pair of gloves and perhaps a rain gear. Behind the legshield there’s a pair of cubby holes for smaller personal items. A standard 12v auxiliary outlet resides in the right cubby hole where you can charge your mobile phone or connect a portable navigation system. An aftermarket top box would significantly increase storage capacity if needed. 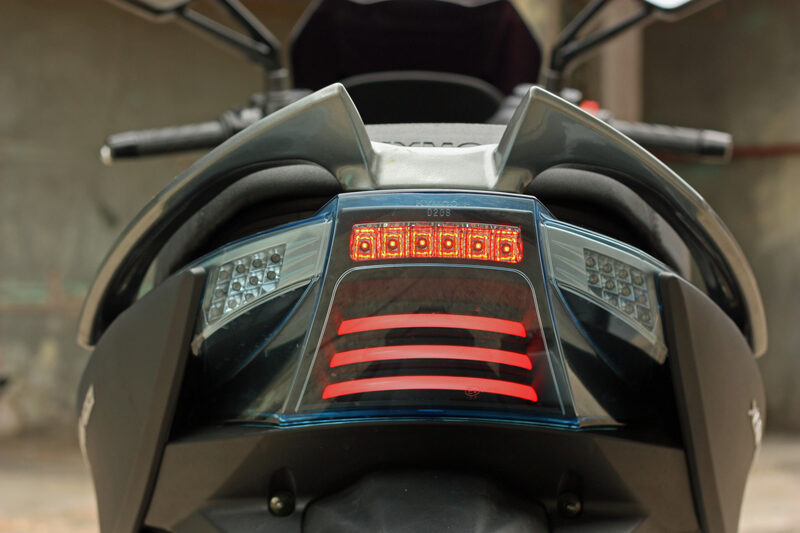 Interestingly, instead of a tall and clear windshield the Xciting has a fixed solid black wind deflector that effectively channels air above the rider’s neck. This setup affords an unobtrusive view of the road, but it exposes the rider’s helmet to some wind buffeting at extra legal highway speeds. Housed behind the wind deflector is a minimalist instrument cluster composed of a large analogue tachometer with a digital speedometer inset. Beside it is a multi-information display that shows fuel, trip, odometer, engine temperature and clock. They’re quite legible at night but a bit difficult to read in direct sunlight. Powering the Xciting 400i is a newly designed 399 cc liquid-cooled single-cylinder motor rated at 35.54 bhp @ 7,000rpm and 27.29 lb. ft @ 6,000rpm, which is only 2bhp down from the old motor powering the Xciting 500 of last year. But more significantly, the new Xciting is a whopping 20 kg. lighter than the previous model, thus resulting to a superior power to weight ratio. 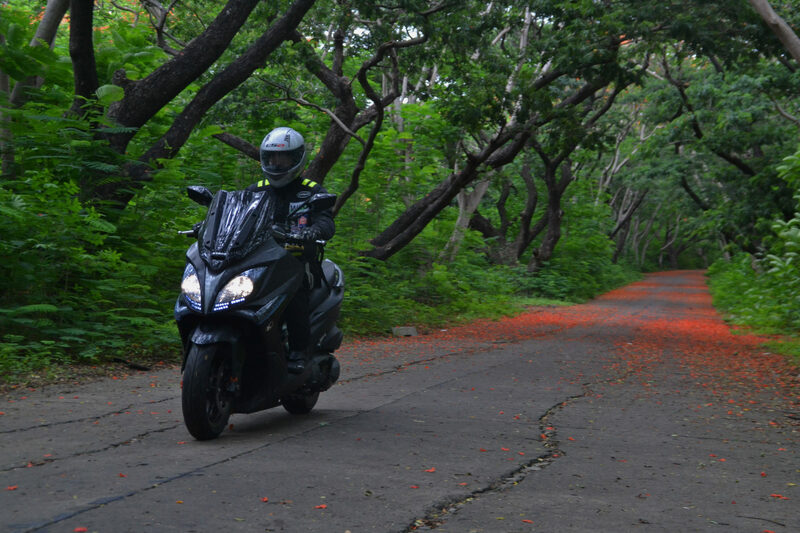 And this can certainly be felt once you whack open the throttle from a full stop, catapulting the Xciting authoritatively to a top speed of 162 km/h. Like most other scooters, the motor is connected to a smooth and responsive CVT (continuously-variable transmission) for twist-and-go convenience. Scrubbing all that speed are handled by a trio of cross-drilled petal disc-brakes; two in the front and one in the rear. It should be noted however that only the two front calipers are modulated by ABS (antilock braking system) and none in the rear. So don’t be surprised if you accidentally lock the rear wheel when you squeeze the left brake lever in panic. It’s easy enough to modulate to the point of locking up though. Adapting current sport bike design standards the front brake calipers are radially mounted clamping on floating disc rotors. For added safety, there’s an ingenious hand brake lever located on the right leg-shield. It may not be obvious at first glance but wrapped in Maxxis tubeless tires are actually staggered 120/70-15 front and 150/70-14 multi-spoke aluminum rims. 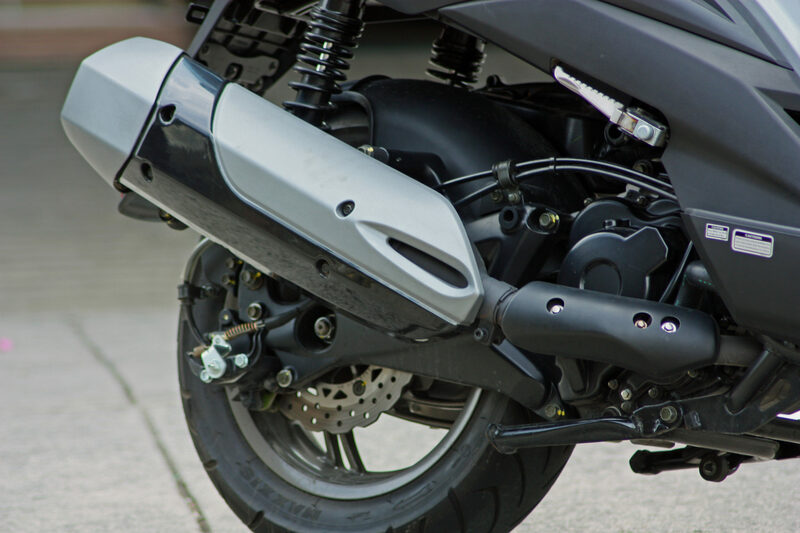 The front are connected to a telescopic front forks while the rear are propped by dual shock absorbers. The Xciting 400i features a rigid dual underbone chassis design that not only reduce vibration but also enhance high speed stability. With most of the weight centered at the bottom, handling is relatively neutral allowing you to effectively counter-steer the bike with just the handlebars. No need for hanging out antics. 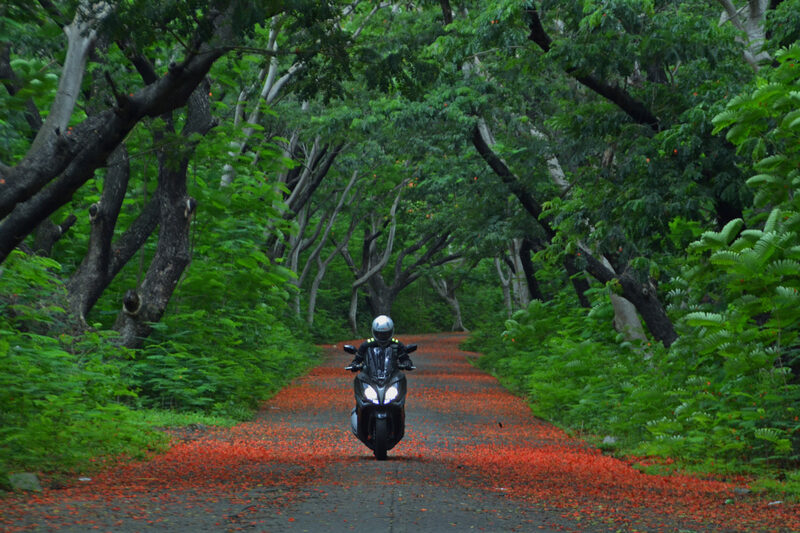 Ride quality is compliant enough over ruts and various road surfaces. 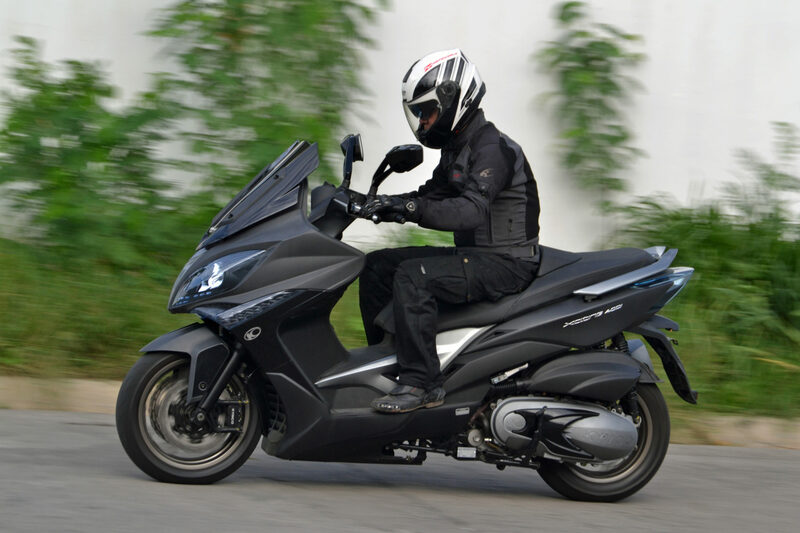 With over 40 years of scooter manufacturing expertise under its belt Kymco certainly knows how to make high performance maxi-scooters. 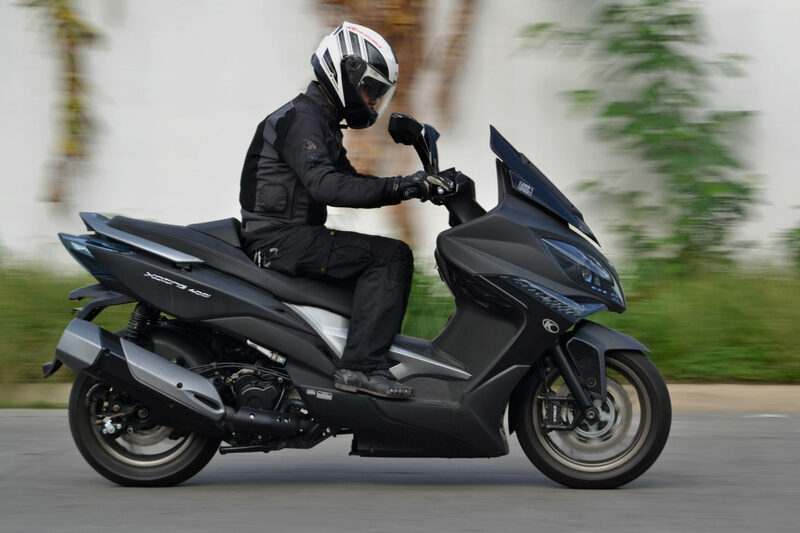 In fact, after riding the Xciting 400i for a considerable amount of time I was finally convinced that a maxi-scooter of its calibre can take the place of a couple of bikes in your garage; a commuter and sport-tourer rolled into one. Effectively bridging the gap between scooter and sport touring functionality. At 339K it sit smack in the middle of some serious competition. But if you’re looking for a fast, convenient, comfortable and good looking sport tourer alternative then the Xciting 400i deserves a place in your short list. It might be less involving to ride compared to other big bikes but it’s certainly no less fun.